U S Bottlers, automatic pressure / gravity bottle filling and capping line rated from 100 to 420 bottles per minute – depending on materials and application All stainless steel contact parts. Container size range: 1" to 4" in Diameter x 4-1/2" to 12" in Height. Cap size range: 1/2" (13mm) to 3-1/2" (89mm) in Diameter x 1" to 2" in Height with proper change parts. 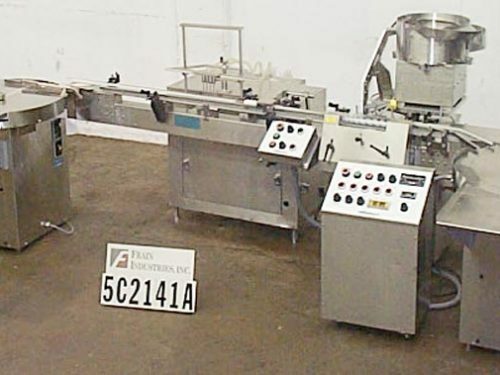 Line consists of US Bottlers model GE48LS, 48 head rotary pressure gravity filler with 3/8" OD filling nozzles set on 4-1/4" centers to Pneumatic Scale 12 head rotary air chuck capper, set on 6-1/2" centers with cap feeder and hopper with worm screw to star wheel container in feed and discharge. Remote control panel and statis light bar. Mounted on individual base frames.